Please try again. If you experience further problems, please contact your local MED-EL representative. A confirmation email has been sent to you. Follow the instructions in the email to confirm your registration and activate your account. Please note, the email may have been filtered into your spam folder by your provider. 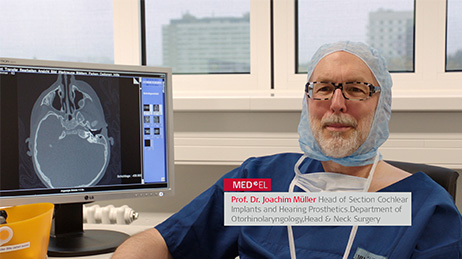 Prof. Dr. Müller implants a SYNCHRONY CI in a 2 years old patient presenting slight variation of the facial nerve. The structure preservation technique is demonstrated with STANDARD electrode array and Fixation Clip.